A ghost bike for Chaim Joseph, who was killed by a hit-and-run truck driver in February. Police have arrested the hit-and-run oil truck driver who they say killed Chaim Joseph near Times Square last month — but declined to charge him with the far more serious crime of fleeing the scene. Cops arrested 56-year-old Kenneth Jackson, who lives in Queens, on Tuesday with failure to yield and failure to exercise due care when, police say, he drove the 2013 oil truck into 72-year-old Joseph on Eighth Avenue near 45th Street on Feb. 4 at about 5:53 a.m. — the charge of failure to yield suggests police believe Joseph had the right of way and was pedaling with the light when Jackson allegedly ran him down. But a spokesman for the Manhattan District Attorney’s office could not explain why Jackson was not charged with leaving the scene of a fatal collision — a felony that could result in a maximum of seven years in prison — saying that he has not been arraigned yet and to ask police since cops issued him a Desk Appearance Ticket to appear in court some time in May. “He was issued a DAT, so we don’t have any guidance, can’t speak about the case. PD would have that,” said Justin Henry. But police said to ask the District Attorney’s office. In the days following Joseph’s high-profile death, police handed out summonses to cyclists — including one for not wearing a helmet, which is not against the law — leading activists to protest the NYPD’s unjust crackdown against bikers, and especially e-bike delivery workers, outside the Midtown North station house later that week. Cops arrested the hit-and-run driver who killed Chaim Joseph last month. Jackson, who worked for Brooklyn-based Approved Oil company, faces a maximum of 30 days in jail — although such sentences are rare. Joseph is at least the third victim Approved Oil drivers have hit and killed since 2017, according to reports. Company employee Steven McDermott failed to yield to 27-year-old Sarah Foster on Feb. 15, fatally striking her as he made a left turn from Third Avenue as she crossed E. 37th; and in March 2017, an Approved Oil driver hit and killed 59-year-old Danielle Leathers in the Bronx. An attorney for Approved Oil defended both the company and Jackson, instead putting the blame on the dead cyclist for biking in dark clothing early in the morning. The lawyer also said Jackson didn’t know he had hit anyone — a common excuse that often leads authorities to drop the more-serious leaving the scene charges. Cops still charged Jackson with failure to yield, but Maffeo says he plans to “vigorously” fight the charges, citing his client’s otherwise clean record. Maffeo said Approved Oil drivers must take a safety training program. He also defended the company’s record, even though three of its drivers have hit and killed three people. This is missing one very important piece of information – the company he was working for. If it were Approved Oil, for instance, that would be grounds to launch a campaign to have them banned from the city. By “grounds to launch a campaign,” are you referring to some formal mechanism that’s already in place? Was that added to the article after you read it? Or do you mean (understandably) that it doesn’t make totally clear that Jackson was on the clock for Approved when the crash happened? Police have arrested the driver who hit and killed former Columbia University professor and dean Peter Awn. Police took immediate action — a stark contrast to the NYPD approach to multiple recent fatal collisions. Another person is dead in a back-over incident. 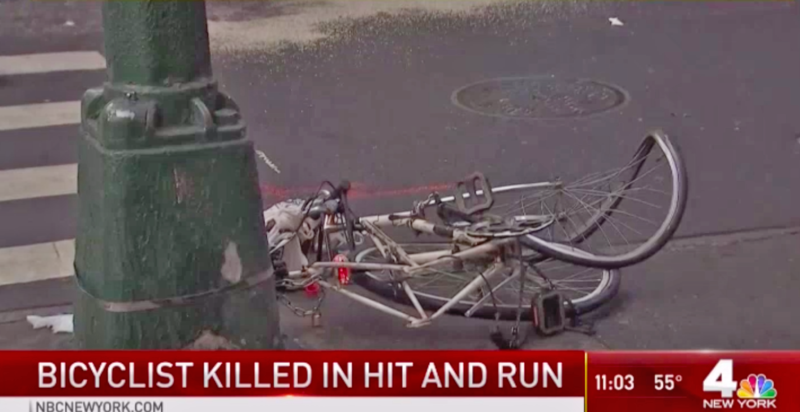 Police are hunting the truck driver who killed the cyclist near Times Square early Monday morning.